Istria is the largest peninsula in the Adriatic Sea, located at the head of the Adriatic between the Gulf of Trieste and the Kvarner Gulf. Its territory is shared by three countries – Croatia, Slovenia, and Italy. 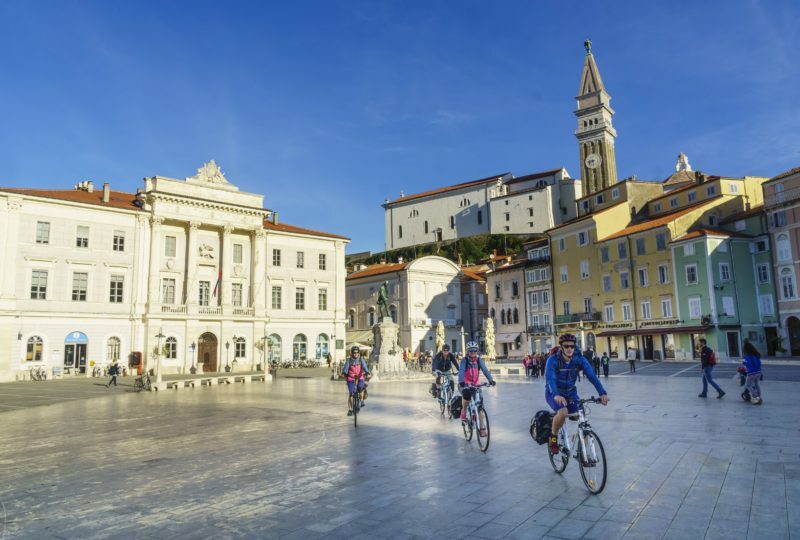 On the western side of the Istrian peninsula one can find picturesque towns like Piran or Umag, with their cobbled piazzas, shuttered houses and back alleys laden with laundry. Meanwhile, the inland Istria is an area of rare, disarming beauty characterized by medieval hilltop settlements and stone-built villages. The historic hilltop towns like Motovun and Grožnjan look like remnants from another century with their ancient, half-abandoned stone-built structures rising above the rich green pastures and forests. 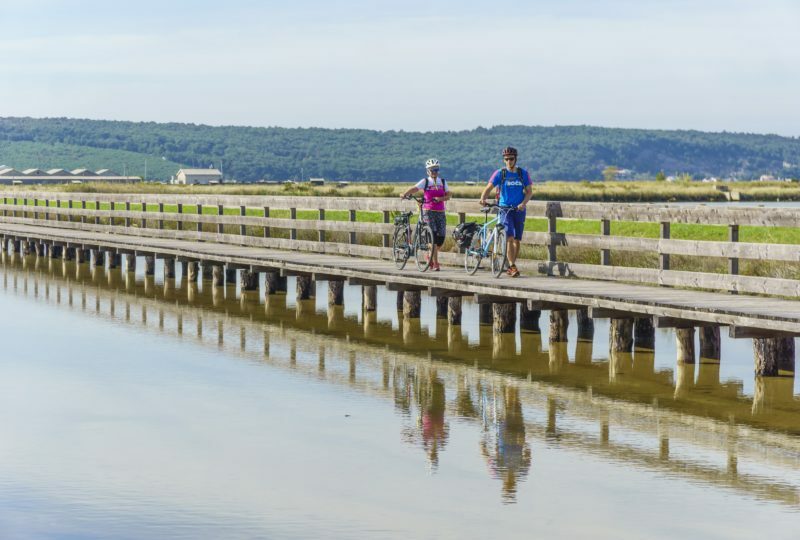 In the scope of the Adriatic cycling tour, a perfect way to explore Istria is on bike, following the abandoned Parenzana railway track, which offers the most stunning sceneries. Parenzana is an abandoned, 123.1-kilometre narrow-gauge railroad connecting 33 Istrian towns from Trieste to Poreč, which was in operation in the early 1900s. The railway used to be of vital importance for the countryside villages, as it operated daily through the hilly karst landscape of Istria to transport passengers, salt (from Piran and Sečovlje), olive oil, fruits, vegetables, Istrian stone, lime, wood, flour and wine. 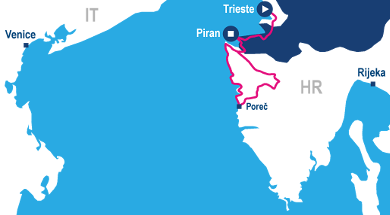 Starting in Italy, the tour runs along the coast to the picturesque coastal town of Piran, a slice of Venice in Slovenia. 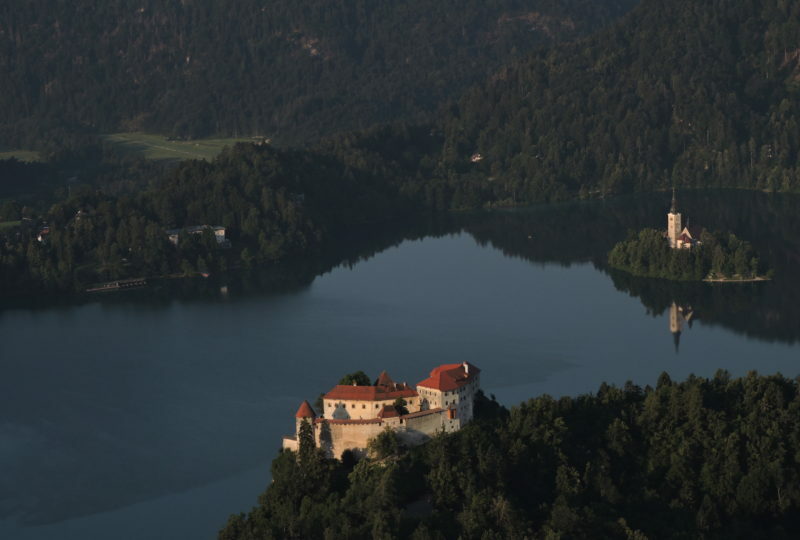 The small historic towns are probably the highlight of the tour – the world-famous inland towns of Grožnjan and Motovun in Croatia are next on the list. Before returning to and ending in Piran, the tour turns back to the coast, stopping at the towns of Poreč and Umag. 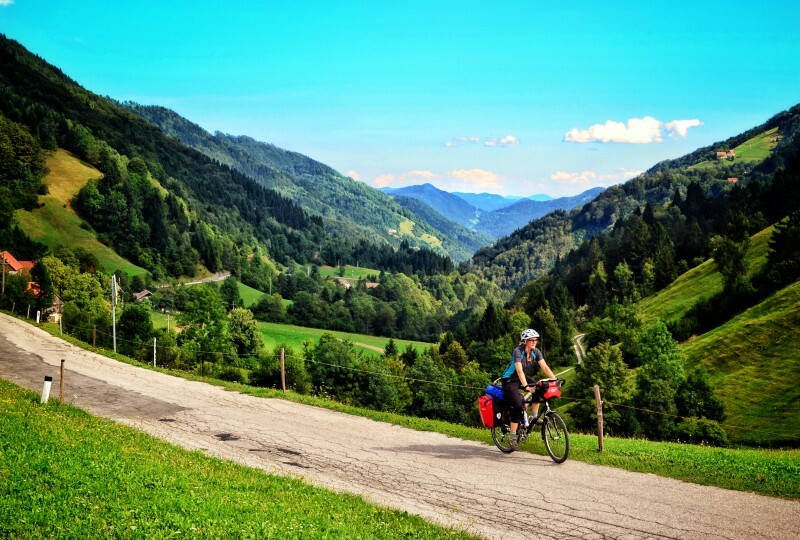 Easy cycling, relaxing and magical nature, charming towns, interesting history sights, excellent food and wine, welcoming locals and the warm sea – it is hard to imagine a better way to spend a holiday. The tour is suitable for everybody, including families. However, for the more eager cyclists, there is always enough time to explore other local routes in the course of the day. 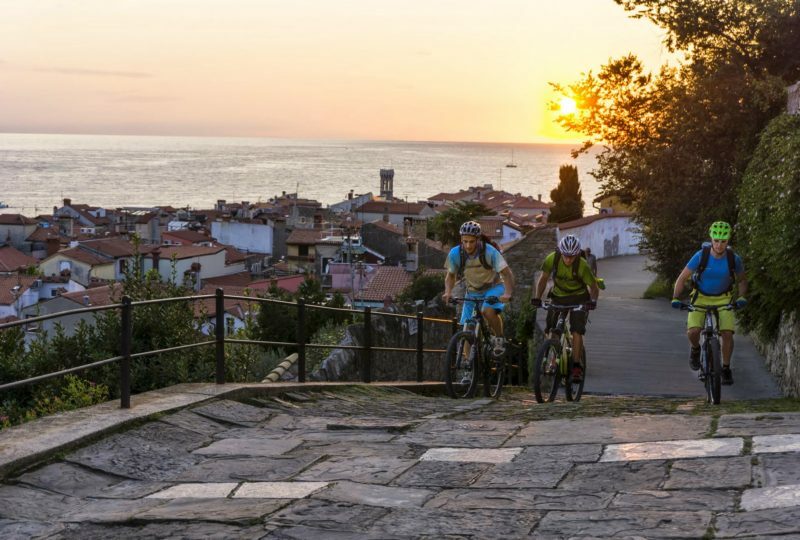 The Istria to Adriatic cycling tour starts in the coastal town of Muggia near Trieste, the only Italian port town in Istria. The town’s architecture is marked by Venetian and Austrian history, while its harbour hosts a modern 500-berth marina. Muggia shows many traces of its Venetian tradition and origin, as demonstrated by the dialect, gastronomic tradition, Venetian Gothic style of architecture, and mostly by the main square, which is a true Venetian “campiello”. A group briefing takes place before overnight in this lovely town. A scenic ride along the Adriatic coast is characterized by rich sub-continental Istrian karstic vegetation. 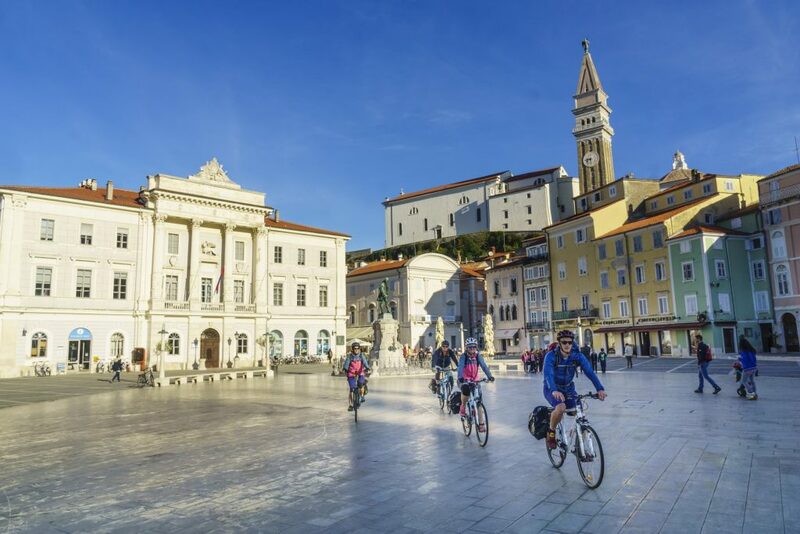 Soon after Muggia, the tour enters Slovenia and passes the coastal towns of Koper and Izola to reach the charming town of Piran, a slice of Venice in Slovenia. Sitting pretty at the tip of a narrow peninsula, the picturesque Piran is the most popular site on the Slovenian coast. The old town, which is one of the best-preserved historical towns in the Adriatic, is a gem of the Venetian Gothic architecture. It is hard not to fall in love with Piran’s atmospheric winding alleyways, sunsets and seafood restaurants. The highlight of the day is a tiny inland town of Grožnjan in the Croatian part of Istria. Much like the neighbouring villages, Grožnjan, which sits at a hilltop rising 228 meters above the sea level, has kept a faithful watch over the Mirna valley for centuries. For a while, the town was actually a castle as the Great Gate at its entrance used to have a drawbridge. The town’s rich history is a result of its changing level of strategic importance, with the final blow to the town’s size of population coming after World War II, when many Grožnjan’s residents emigrated to Italy. In 1965, in an attempt to save the dying town, Grožnjan was formally declared the Town of Artists. The creative artists and gallerists moved in and began transforming it into the art camp and the town has retained this status to this day. Today, some 30 galleries occupy its premises, whil the place is also home to the seat of the International Cultural Center of Young Musicians. The path to the destination is far from boring. While cycling to the Slovenian border with Croatia, the tour passes the Sečovlje Salina Landscape Park with the Sečovlje Saltworks, the largest Slovenian salt evaporation pond and one of the few facilities where salt is still produced in a traditional way, which is also a wetland of international importance and a breeding place for water birds. The saltworks have been in operation since the 13th century. The salt production has continued to this day in order to preserve the natural and cultural heritage. Before reaching Grožnjan, there is yet another picturesque place sitting at the top of a hill that is well worth a visit – the town of Buje. 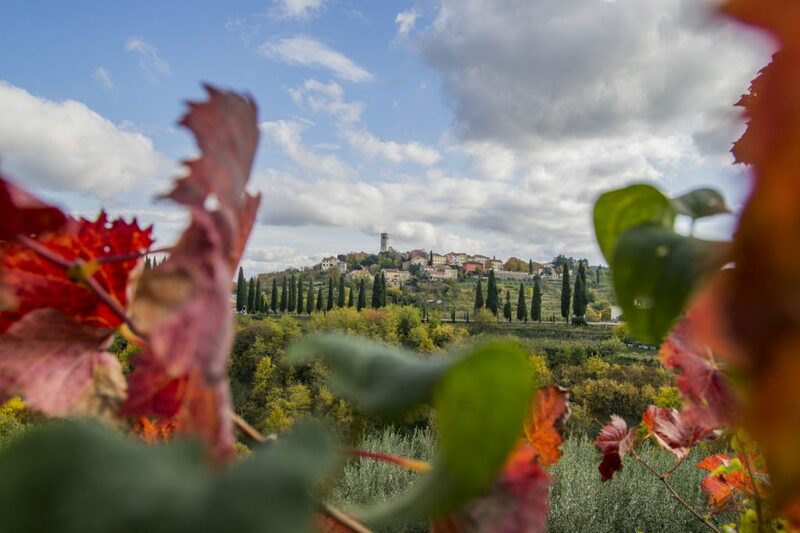 In the northern part of Istria, overlooking the Mirna river valley, lies the most famous and attractive Istrian medieval town called Motovun. The captivating hilltop settlement is often used as a typical Istrian interior decoration motif. Situated on a hill rising 270 metres above the sea level, its houses are scattered all around the area. The 13th century Romanesque Gothic bell tower with a crenulated crown, which stands next to the Parish Church of Saint Stephen from the 17th century, dominates the town’s historic core. 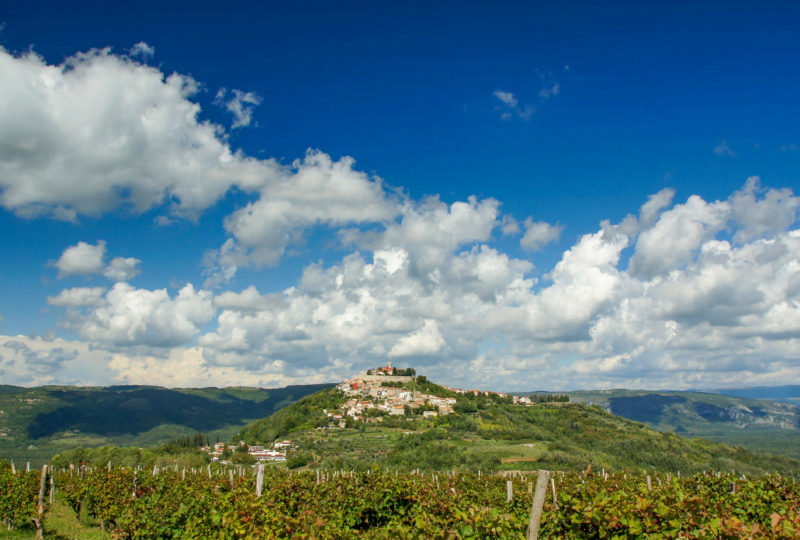 Motovun serves as a venue to many events, the most significant being the International Motovun Film Festival that takes place at the end of July and where many world-renowned film artists can be spotted. The Mirna river flows at the foot of the hill. 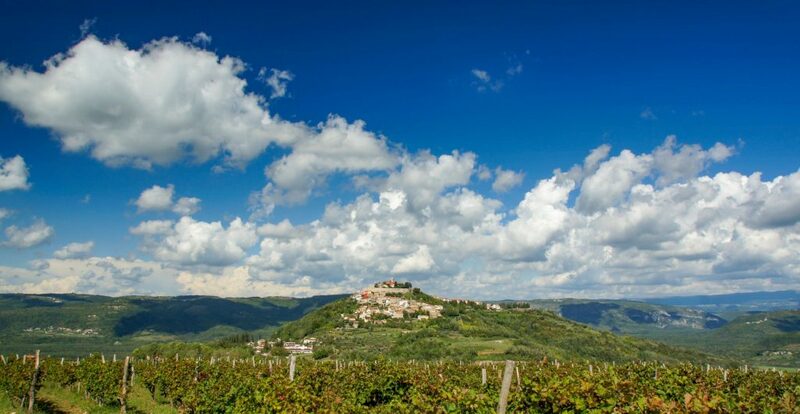 On the other side of the river is the famous Forest of Motovun with an area of about 10 square kilometres and a patch of 280 hectares that has been placed under special protection. This area is completely different not only from the nearby forests but also from the entire surrounding karst region because of its wildlife as well as the moist soil rich with prized black and white truffles (Tuber magnatum) which grow here in abundance. Day 4 is all about comfortable cycling along the fields that are rich in fertile red soil, before returning the coast. The final destination is the town of Poreč at the western coast of the Istrian peninsula. The major landmark, the 6th century Euphrasian Basilica in the historic old town, is famous for its gem-studded Byzantine mosaics. In 1997, it was proclaimed a UNESCO World Heritage Site. The almost 2000 years old town of Poreč is situated around a harbour and protected from the sea by the small island of Saint Nicholas. Ever since the 1970s, the coast of Poreč and that of the neighbouring Rovinj have been the most frequented tourist destinations in Croatia. Small historic towns are the highlight of this tour. 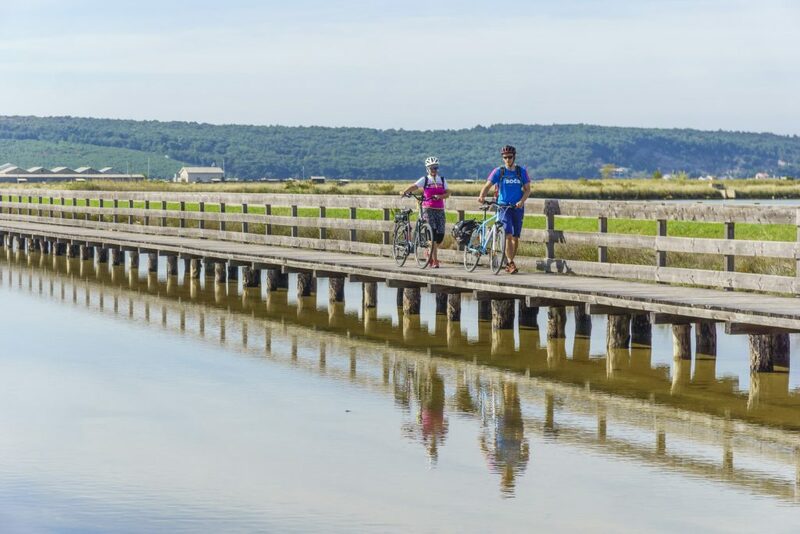 Easy cycling along the coast leads the group to another coastal town – Umag. Its harbour is the Croatian gate to Europe and the first tourist destination to come across upon arrival to the northern part of the Adriatic coast. The town’s history is particularly interesting. A favourite of the ancient Roman aristocracy, who used it as their summer residence, Umag has preserved parts of the town walls and defence towers as well as some of the Renaissance and Baroque houses and churches, the most famous among them being the parish church of the Assumption of Virgin Mary and the church of Saint Peregrine. 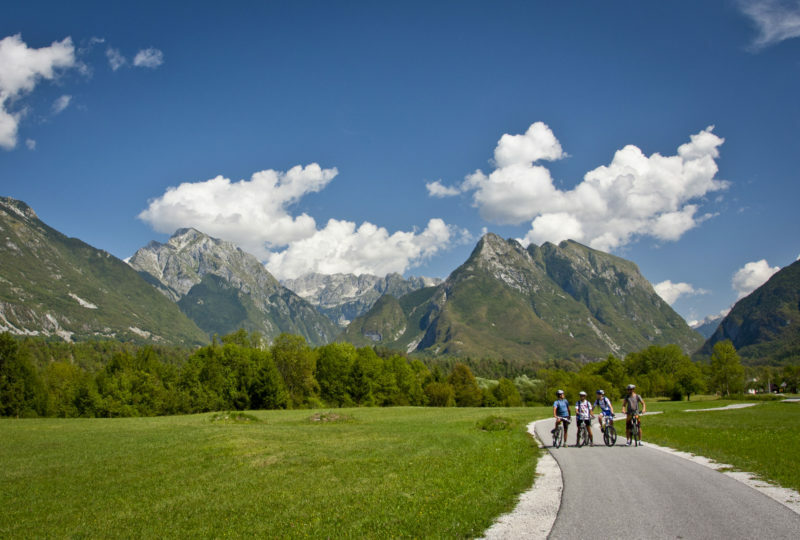 On the last day of the cycling tour, the route follows the Croatian coastline as far as the terrain allows. It is worth to make a few stops and enjoy some more beautiful vistas and the easy breeze before crossing the border to Slovenia. The last leg of the journey leads back to Portorož and then Piran, where the tour ends. Unlike the first visit to Piran on Day 2, there is now enough time left to enjoy the impressive atmosphere of the old town. That would be the right time to enjoy a cup of coffee at the Tartini Square that features a monument dedicated to the great violinist and composer Giuseppe Tartini, who was born in Piran in 1692, and to take a dip in the sea before the dinner. The tour ends with breakfast and transfer to the starting point in Muggia or Trieste downtown. Rates are valid per person, based on double occupancy on pre-scheduled departures. For individual departures feel free to contact us for the offer. Navigation pack: GPS with uploaded routes (one device per group), map and tour booklet. 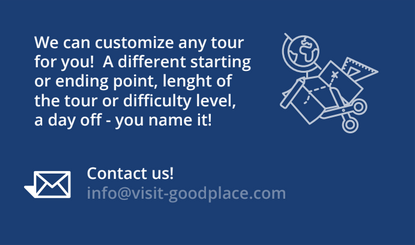 Would you like to customize this tour? Are you worried you are not prepared enough physically? Would you like to select a different starting or ending point, or perhaps have a day off before, after or during the tour? Send an e-mail to info@visit-goodplace.com. 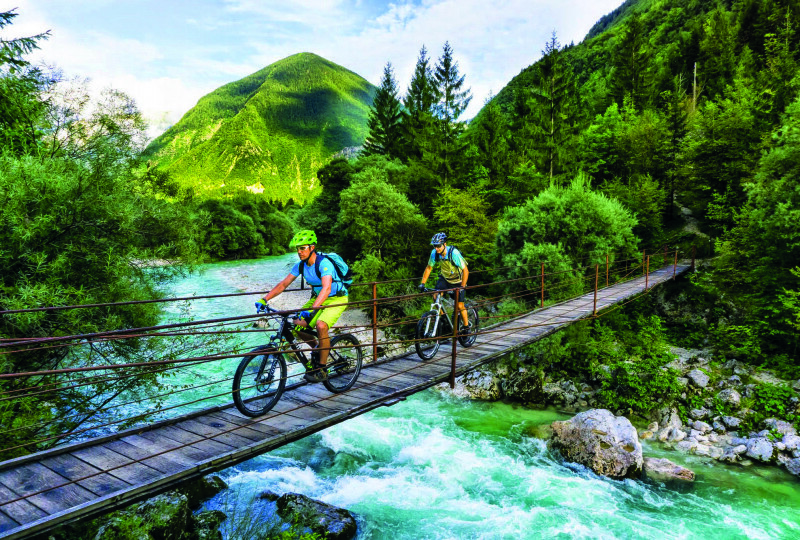 Travelling and activity insurance, personal safety and cycling equipment, lunches, any beverages consumed with meals that are included in the package, any other items not mentioned as included. Our adventure starts and ends Muggia, Italy. Trieste is surrounded by 6 international airports, those of Ljubljana, Venice, Trieste, Klagenfurt, Treviso and Zagreb, each of them within a maximum of 180-minute driving distance. We are happy to arrange airport shuttles from any of these airports. The tour is suitable for e-bikers.